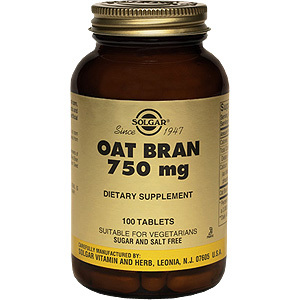 Solgar's Oat Bran Tablets are free of corn, yeast, soy and dairy products and are formulated without the use of preservatives, artificial flavors or colors. Solgar offers a wide variety of fiber supplements of the highest quality and purity including Millers Bran Tablets, Apple Pectin Powder and Psyllium Seed Husks Powder and Vegetable Capsules. Other Natural Ingredients: Vegetable Stearic Acid, Silica, Microcrystalline Cellulose, Vegetable Cellulose, Vegetable Glycerin. 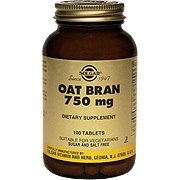 Oat Bran 750 mg is shipped in a discrete, unmarked package. Orders are processed immediately and usually take about 3 to 5 working days to be received. We do ask that you try it for 2 to 3 weeks to feel the full effects. Any information received is used only for order processing and shipping purposes. Your information, such as e-mail address, will never be disclosed to a third party.